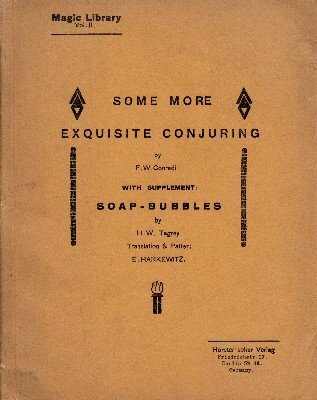 When publishing my first book in the English language, Exquisite Conjuring , I was led by the thoughts, that perhaps, after having edited over 30 books about Magic in German, it may be an interesting experiment to see, what the English speaking fraternity would have to say, if I would publish a book in the English language and if the praise, I received from all sides as an author of books on Magic since these last 20 years and more, would really warrant such a new venture! Well, I must say, that my expectations have not only been realised, but they have in fact been surpassed by far in the way, in which my first book in English has been received and I take this opportunity to thank all and everybody most heartily for their goodwill and praise, they have been good enough to spend me. These kind words have been an encouragement to dedicate to all my English and American friends this my second book in the English language and I hope, that it will have a similar success, as my first one. Translation and patter by Eugene Harkewitz. 1st edition ~1920, 55 pages; PDF 64 pages.